One of my biggest pet peeves with dodging and burning techniques is that it can may make your image look muddy and gray if you have a large area to address (say, lightening an eye shadow or darkening an over-exposed forehead). But you can tint your adjustment brush with whatever color your desire. Even better, there’s a trick for picking the precise color from anywhere on the picture... in fact, from anywhere on your computer screen. Then hold and drag to the point on your screen you want to sample. It will same that color. This isn’t the best technique for working with people/portraits, but it works great with landscapes and other images. 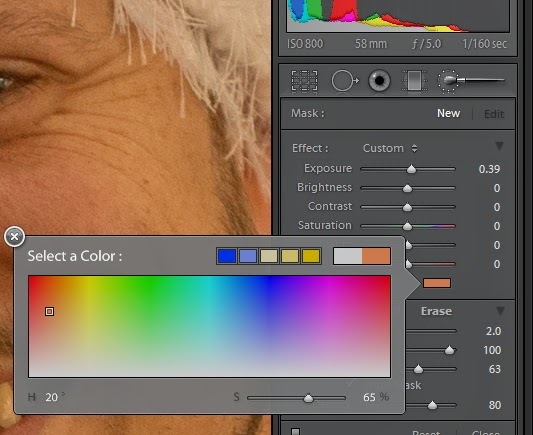 The color picker tool also works with the Graduated Filter.